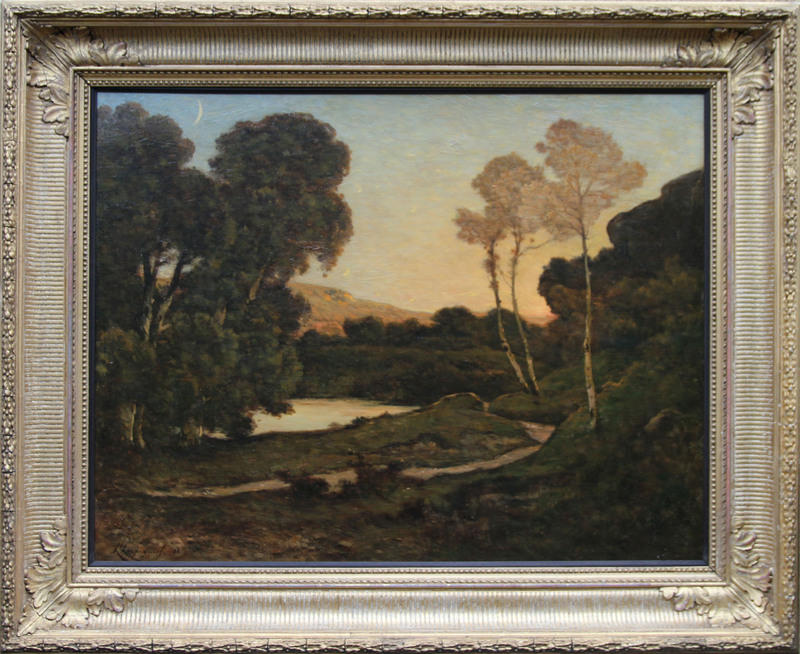 A superb, large, museum quality oil painting by French Barbizon artist Henri Joseph Harpignies. 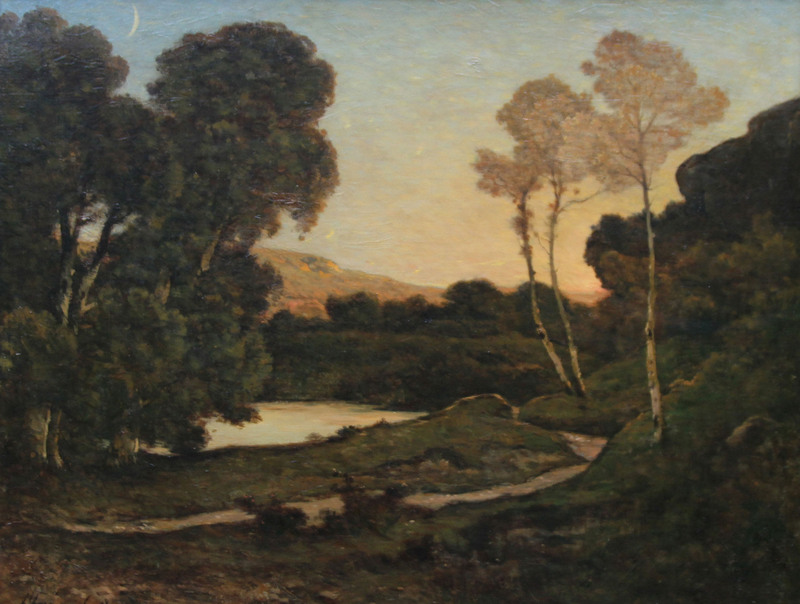 The oil on canvas depicts a panoramic nocturne in his Romantic Barbizon style. It is a fine work by one of the leading artists of the day. It has beautiful subtle colouring and pink evening tones. It was painted in 1898. Harpignies was one of the great French landscape painters of the 19th century and this is a large and impressive work. His works are housed in every major gallery in the world. Signed lower left and dated 1898. Ex Christie’s 1960s' when catalogued as by Sawrey Gilpin. Framed in a museum quality Empire frame 42 inches by 38 inches. Henri Joseph Harpignies (1819-1916) was born at Valenciennes. His parents intended for him to pursue a business career, but his determination to become an artist was so strong that it conquered all obstacles, and he was allowed at the age of twenty-seven to enter Jean Achard's atelier in Paris. From this painter he acquired a groundwork of sound constructive draughtsmanship, which is so marked a feature of his landscape painting. After two years under this exacting teacher he went to Italy, whence he returned in 1850. During the next few years he devoted himself to the painting of children in landscape setting, and fell in with Corot and the other Barbizon masters, whose principles and methods are to a certain extent reflected in his own personal art. To Corot he was united by a bond of warm friendship, and the two artists went together to Italy in 1860. On his return, he scored his first great success at the Salon, in 1861, with his Lisière de bois sur les bords de l'Allier. After that year he was a regular exhibitor at the old Salon; in 1886 he received his first medal for Le Soir dans la campagne de Rome, which was acquired for the Luxembourg Gallery. He had numerous students, among them Émile Appay (1876-1935), Jeanne Rongier, Jane Le Soudier (1885-1976), Louis-Alexandre Cabié, Pierre Vignal, Raymond Verdun, and Émile Dardoize (1826-1901).